A brief trip from the parking garage, and I’m standing in the main entrance of the SLC Downtown Library. The fourth floor houses nonfiction and music, the reason I’m here. I’m meeting Jason Rabb, the Library Representative spearheading the massive initiative of compiling, organizing and preserving the entire SLUG archive of local music albums. The SLUG local music archive, along with the Downtown library’s own collection of local music, is now available to the public via the Main Library. We finish our conversation talking about HUM hum.slcpl.org, the Salt Lake City Library’s online music-streaming service. 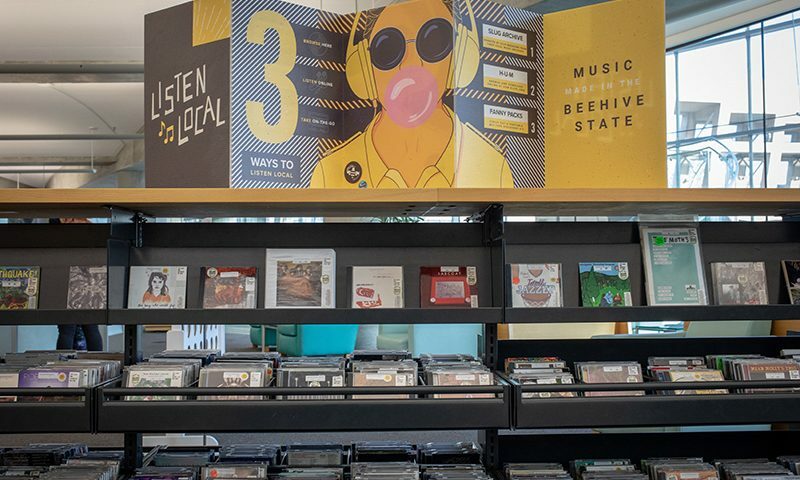 HUM, an acronym for Hear Utah Music, has a variety of local music that has been selected by a community jury (featuring SLUG’s own Editor Alexander Ortega last year). The site, also features a unique posters section that captures unique tidbits from concerts past. In my time with the site I was surprised at the depth and volume of music being made now and nearby. Taking in the breath of creativity in this city is daunting. In this, I understand a little of what it was like five years ago when Rabb started sorting through local CDs.